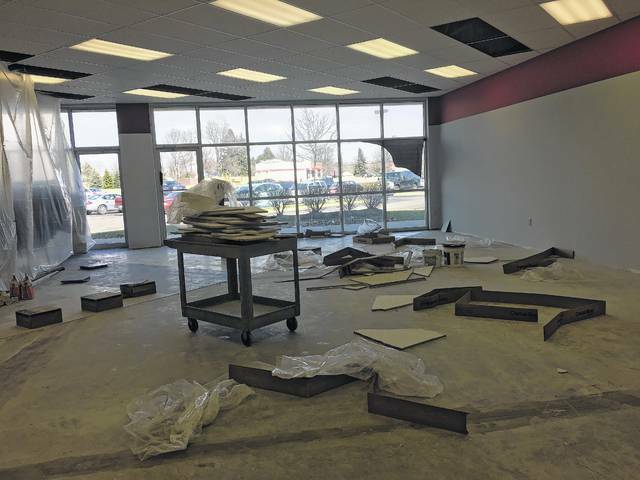 GALION — An expansion that will add an additional 1,100 square feet of space to the Galion Goodwill store is near completion and customers and staff could not be more pleased. Customer Vicki Strohm said she is excited about the expansion that will add retail space as well as 500 square feet to the production area of the store. “I shop here at least once a week. I think the expansion will be wonderful for the store,” said Strohm as she browsed the women’s clothing section. The store’s assistant manager, Roberta Inscore, said the store has been at its current location oat 753 Carter Drive for over a decade. “Before that, the store was located in the shopping center where Save-A-Lot is currently located,” said Inscore. Kathy Wink, marketing director for Goodwill Industries, said that the Goodwill organization was founded in 1908. “Our corporate office in Marion was founded 40 years ago. We are one in 160 Goodwill stores in the United States that have our own board of directors,” said Wink. Wink said the mission of Goodwill Industries is to work to enhance the dignity and quality of life of individuals and families by strengthening communities, eliminate barriers to employment and help people in need reach their full potential through learning and the power of work. “We sell donated items to support our mission which is to create jobs for people and break down barriers to employment,” said Wink. Store manager Penny Charleston said Galion’s store currently employs 17 people. The store’s expansion project encompasses the vacant store next door to the current location. “That space has been empty for years so we are very excited to be able to expand our store into that area,” said Charleston. Charleston said the increased space in the production area of the store is extremely important. “Our production staff have daily and weekly goals to meet. They sort through all of our donations to determine what is salable, recyclable or reusable,” said Charleston. Charleston said even older clothing with holes can be recycled. Charleston said the store receives donations daily and is open from 9 a.m. to 9 p.m. Monday through Saturday and 10 a.m. to 6 p.m. on Sunday. For more information, visit http://www.goodwill.org. Donations to Goodwill help support retail stores that provide job opportunities in your community. Goodwill accepts gently used items including clothing, housewares, linens, furniture, collectibles, antiques, books, jewelry, video tapes, DVD’s, CD’s, games, toys, sporting equipment and more. Goodwill Industries serving Crawford, Marion, Union, Morrow and Delaware Counties served a total 440 people in work services, 471 in youth programs,382 in job readiness, 36 in workforce development, 1,013 in mission services for a total of 2,541 individuals served in 2016. The five county area that Goodwill serves that includes Crawford County currently employs 302 people which encompasses the 17 staff members at Goodwill in Galion. Source: 2016 Annual Report by Goodwill Industries.